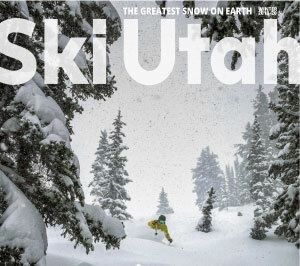 In 1985, a skier and the slogan The Greatest Snow on Earth first appeared on Utah's license plates. Here in Utah, we're crazy about our snow and had a heck of a time limiting this list of Utah snow facts to 10. If you love snow, please share this page. Utah's Cottonwood Canyons are one of the snowiest places in the world, with Alta averaging 551 inches of snow annually. From December through March, more than a foot of snow falls every five days. This creates the perfect "body" to float your skis through powder. If you live for the snorkel-deep days, the good news is that Utah receives, on average, 18 Utah Powder Days (12''+ in 24hrs) throughout the winter. The difference between 40 feet of snow per year in the Cottonwood Canyons and 5 feet per year in Salt Lake City. Enjoy deep powder by day and city living by night. According to historical data, this is the golden winter day. In other words, this day has the highest likelihood of receiving snowfall over any other winter day. On average, 6.7 feet of snow falls each April. Spring skiing is a locals' secret. Now you know. The Great Salt Lake does not freeze, so lake effect is a possibility all ski season long. Resorts within proximity to the lake enjoy lake-effect periods which produce about five percent of the average precipitation from September to May. Over the course of an extended weekend vacation, it's very likely you'll see both new snow and bluebird skies. Do the math, you'll find nearly 300 days of sunshine a year and a foot of snow every five days (see No. 2). At 8,750 feet in Utah, 99 percent of the precipitation during the ski season falls in the form of snow. Suggested Reading. Want to really dork out on interesting snow facts? Read, University of Utah's Meterologist Jim Steenburgh's new book Secret's of The Greatest Snow on Earth. BONUS: Powder Alarm. Here's how NOT to miss that next Utah powder day. Get the Ski Utah mobile app for iPhone and Android, fully equipped with your own Utah powder alarm.